1 The word of the LORD came to me: 2 What do you mean by repeating this proverb concerning the land of Israel, "The parents have eaten sour grapes, and the children's teeth are set on edge"? 3 As I live, says the Lord GOD, this proverb shall no more be used by you in Israel. 4 Know that all lives are mine; the life of the parent as well as the life of the child is mine: it is only the person who sins that shall die. 5 If a man is righteous and does what is lawful and right-- 6 if he does not eat upon the mountains or lift up his eyes to the idols of the house of Israel, does not defile his neighbor's wife or approach a woman during her menstrual period, 7 does not oppress anyone, but restores to the debtor his pledge, commits no robbery, gives his bread to the hungry and covers the naked with a garment, 8 does not take advance or accrued interest, withholds his hand from iniquity, executes true justice between contending parties, 9 follows my statutes, and is careful to observe my ordinances, acting faithfully--such a one is righteous; he shall surely live, says the Lord GOD. .... 24 But when the righteous turn away from their righteousness and commit iniquity and do the same abominable things that the wicked do, shall they live? None of the righteous deeds that they have done shall be remembered; for the treachery of which they are guilty and the sin they have committed, they shall die. 25 Yet you say, "The way of the Lord is unfair." Hear now, O house of Israel: Is my way unfair? Is it not your ways that are unfair? 26 When the righteous turn away from their righteousness and commit iniquity, they shall die for it; for the iniquity that they have committed they shall die. 27 Again, when the wicked turn away from the wickedness they have committed and do what is lawful and right, they shall save their life. 28 Because they considered and turned away from all the transgressions that they had committed, they shall surely live; they shall not die. 29 Yet the house of Israel says, "The way of the Lord is unfair." O house of Israel, are my ways unfair? Is it not your ways that are unfair? Ezekiel attempts to answer the question of how God could allow Judah to be defeated, the temple destroyed, and the people dispersed. He quotes a proverb representing a fatalistic view of God's sovereignty and then explains why this is not true. They can return to God's favor by essentially living by the law. In a sense, it's the grace side of the 2nd Commandment (Exodus 20:5-6) showing favor to those who follow God's commandments. 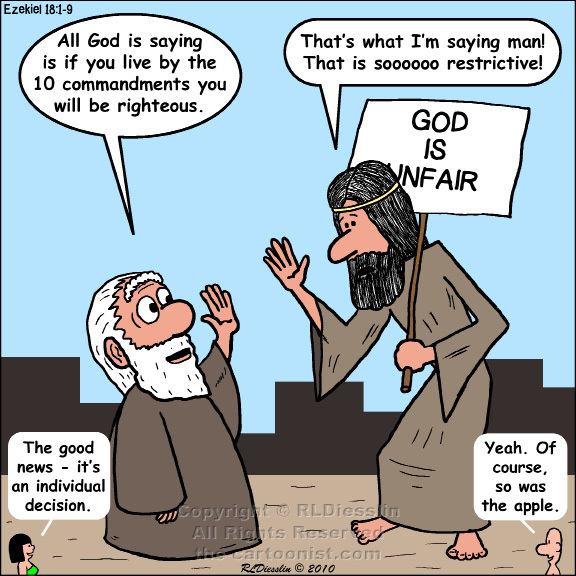 He counters their arguments that God is unfair by suggesting that God's righteousness is fair, but it is their ways that are not.